This board has been so great to me helping me build my key collection and also giving me direction on what to buy. Working on one of my next keys and would love some direction. If you were making a key purchase today and this would probably be the biggest purchase for the year which direction would you go? Also if anyone has any leads it would be great. Looking to go at least OW and no chipping. As always thanks for everything!!! Ok one response for Hulk 1 and one for FF 1. I want them both so let me ask which would you start with so hopefully the 2nd one has not outgained the first and become less attainable for me? Ok seriously Jim for President! Thank you so much for taking the time and effort that put together such a solid argument. I would agree with all of your points. I am going to lean heavy hulk unless a great FF1 deal rolls around. Which one do you like personally? That's the one I would choose. Forget the investment potential since both are great investments. And on an FF1, I’d look for the tougher dark green monster with no creasing or scuffs inside of his mouth. Not easy to find that combination with what Jim mentioned already. It sounds like you've made your choice and gone with Hulk. That is what I would go for. I love FF 1 but do not have one. I searched for quite sometime before I could find a Hulk 1 that I could afford and that wasn't totally blown apart. Both are such amazing books for several reasons. When there’s a specific comic I want offered in the condition I like, and I actually have the money to buy it, that’s usually the end of the decision making for the day. I would go with FF 1 -- there is so much room for growth in the short term but especially in the long term. 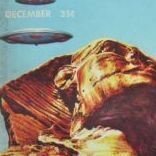 It was a neglected key for a decade or so, and has a lot of ground to make up, meaning that, I think, you can buy it more cheaply now than you will an IH #1, which will grow but at a slower clip. And make absolutely no mistake: Marvel Studios/Kevin Feige, either by acquisition or licensing, will get their hands on the Fantastic Four universe, which has one of the most impressive benches of characters to support the FF universe. Think beyond the "core 4" ... instead, think Dr. Doom, Galactus, Surfer, Annhilus, Alicia Masters, etc. Doom, Galactus and Surfer alone are major, major heavyweights to make the FF cinematic universe stand on its own, which, in any event, won't be the case because FF will be inter-woven with the overall Marvel Cinematic Universe, making a cinematic FF all the more mind-blowing. The 2005/2007 films were incredibly stupid and miscast, and the 2015 film was utterly misconceived by a horrible director -- and both efforts overseen by a clueless studio. We have yet to see a serious FF film effort that stays with the tone of the Kirby-Lee canon (I don't count the low-budget 1994 Roger Corman film). IH #1 is a great book and tougher, to be sure, but there's not much more that Marvel Studios can do with the character other than to continue have him appear as recurring, fan-favorite, 'supporting muscle' in future Marvel Studios films and, yes, that will influence the pricing of IH #1 in the coming years -- the same way the Fantastic Four's non-appearance in Marvel Studios films (or misuse in Fox Studios films) clearly influenced the pricing of FF #1 in years past. I recently threw out a line with my FF1 and a deal came together ( mixed feelings). So I say without bias, I think FF1 will outpace IH1 in the coming years...making FF1 the more time-sensitive procurement. GPA shows data for 22 sales of FF 1 in the last 12 months (in 3.0, 3.5 and 4.0) with huge upswings in sales prices over the last year. 3.0's were selling for ~$3,500 a year ago vs. the last sale of ~$9,000, and 4.0's were selling for ~$7,000 a year ago vs. the last sale of ~$13,000. GPA shows data for 19 sales of Hulk 1 in the last 12 months (in 3.0, 3.5 and 4.0) with fairly stable sales prices. I posted this graphic last week in the AF 15 thread, but I think the image is relevant here as well. 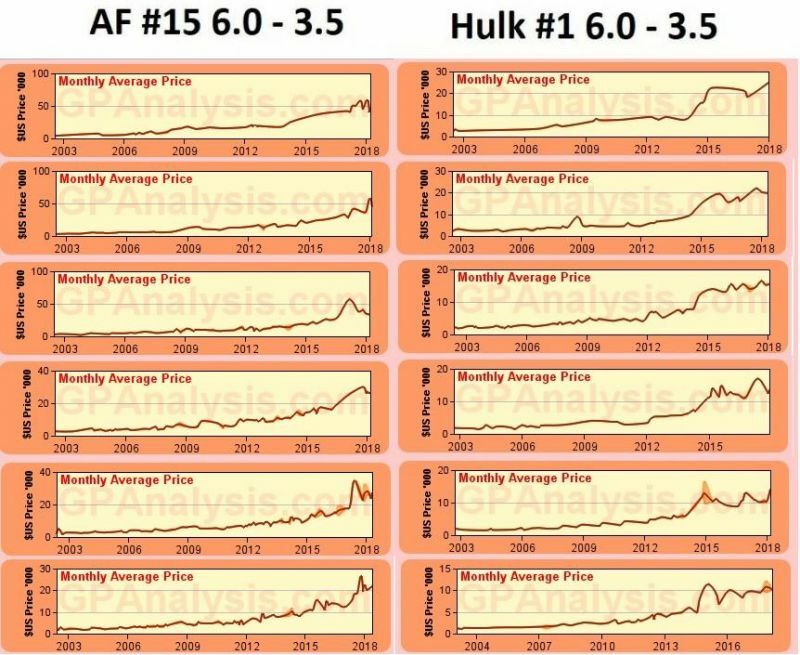 I suspect FF 1 is about to peak like Hulk 1 did around 2015 and like AF 15 did last year, and FF 1 sales over the next year or so will follow the trend below for what happened to AF 15 and Hulk 1 after their peaks. I'd go for a Hulk 1 before it picks up steam again after ~3 years of holding steady price-wise. go with the world's greatest comic magazine. i couldn't agree more with what jim said. plus he's right about hulk 1 not really having moved in a few years, as opposed to FF1 being very hot just now. as with most investments, the time to buy is when it is not hot. FF1 very hot right now! ouch!